ribs ... mmmmmmmmmmm, originally uploaded by Seligmans Dog. I haven't done ribs in about a year. That time we made too many half racks, didn't cook them long enough and then served them to guests whom we didn't know had an aversion (or allergy) to pork products (we didn't know ahead of time). Needless to say, the experience left me a bit scarred on rib cookery. The other night, we had our surrogate Columbus parents in for a meal of ribs, corn pudding and green beans. I got the ribs from plain old Kroger, removed the membrane (thanks for the instruction from Mike - worked easy), gave them an ever so light rub, let rest overnight and cooked 'em around 250°F for about 8 hours with a light slather of sauce (Charcuterie Carolina Sauce) 2 hours before the end. Covered them a couple hours and dug in. I have never been so happy with the leftovers from that rib session. I told Frankie the other morning I was taking out the leftover ribs for thawing so we could have them for dinner. She asked if we were having company. That's how good they were. She (and our friends) ate many. I am copacetic with ribs again. Wow, that's a serious smoke ring you got going on-they look fantastic. The cheaper, lowest quality ribs I can find, the better. I got plain old Smithfield this time. They were good. I still have a small dinner size bunch of leftovers. Dave - Those look great! I can only imagine how good they taste. 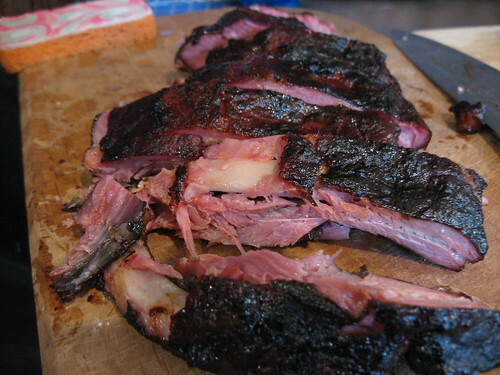 I haven't had ribs in several weeks...it looks like I need to think about doing some of my own next week! I'm glad the membrane popped off easy for you. I think it makes quite a difference on the finished food. Those ribs look great. I have an allergic reaction to aversions. Huh? And, which is why when even I have just a few friends over, there's the pork action, beef action, and chicken/sausage. Oddly enough, there are rarely leftovers! Please do ribs again....as in now!